4.7 Example 1 : If a person deposits Rs 10000 in a Bank as an FD for one year, how much interest does he get after one year and after 2 years? Assume in the above case, the depositor chooses not to receive the interest after one year but requests the bank to pay him interest at the time of maturity of deposit (I.e. after 2 years). In such a case should bank pay him more interest than Rs 1200? Bank does pay him little more. It pays interest on the first year interest (Rs 600) at the same rate of 6%. Why does bank pay extra? This is because, Bank has used the interest amount for one year for it’s activities and hence bank is bound to give interest on interest. This is called ‘compound interest’. In case of simple interest, the principal amount remains constant throughout, whereas in the case of compound interest, the principal amount goes on increasing at the end of the period (term). Let us calculate simple and compound interest for an initial deposit of Rs 10,000. The above table can be represented in a bar chart as given below. 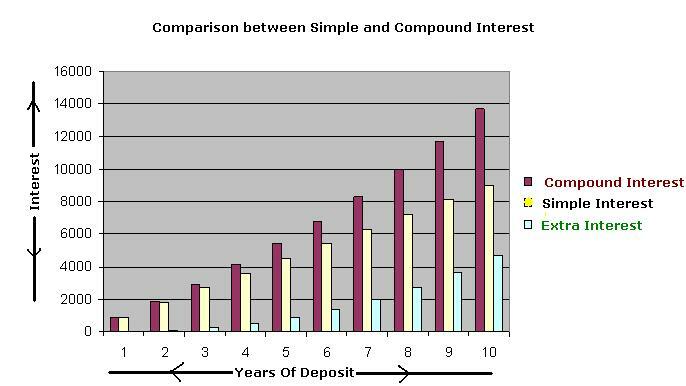 We clearly see the benefit of compound interest on deposits. The benefit increases with the increase in the term of the deposit. Do you observe that the initial deposit nearly doubles? Normally compound interest is calculated quarterly and hence the initial deposit doubles in a lesser period than mentioned above. The Banks also use pre calculated table of interest called Ready Reckoner for calculating compound interests for different periods and different rates. Thus in all he gets Rs. 2934.37 as cumulative interest. Compare this with Rs. 2400 he gets as total interest in simple interest method (4.5 Example 1). In compound interest method he gets Rs 534.37 extra. Thus cumulative fixed deposit is useful for people who do not need interest money often and who are willing to wait for the total amount to be received at the end of maturity period. In the above Problem we had calculated compound interest yearly (interest on interest was calculated once a year). However Banks calculate the compound interest quarterly (i.e. once in three months). Since a year has 4 quarters, Banks calculate Compound interest four times in a year. 4.7 Problem 2: Simple interest on a sum of money for 2 years at 6.5% per annum is Rs5200. What will be the compound interest on that sum at the same rate for the same period? SI = (P*n*R) /100 = 40000*2*(13/2)/100 = 40000*13/100 = 5200 which is the Si given in the problem, hence our value for Principal is correct. CI-SI = 9960-9600 =360 which is as given in the problem and hence our value for P is correct. Verification: By substituting value of n and others in the formula for CI, find out that amount received is 13230. 4.7 Problem 5: At what rate per cent compound interest, does a sum of money become 2.25 times itself in 2 years? Here N=2. Since we are given that amount becomes 2.25 times in 2 years, A =2.25P. A = P*(1+(R/100)) N= P*(1+(50/100))2 =P*(150/100)2 = P*(3/2)2 = P*9/4 = 2.25P which is as given in the problem. Normally, companies buy machinery and equipments for their use. Because of the usage, the value of the machine reduces over a period. This is the reason why second hand machine or vehicle is available at a lower price. This is reduction in value is called ‘depreciation’. The rate at which the value reduces is called ‘rate of depreciation’. Thus 29,250 is the likely population of the town after 10 years. While calculating the compound interest, when the interest is compounded at different periodicity other than every year, the formula for compound interest calculation changes slightly. Let R be the rate of interest per annum and N be the number of years for which the interest is calculated and t be the periodicity(year, half yearly, quarterly, monthly) with which compound interest is calculated. The above change in formula is due to the fact that, the rate per year is converted to rate per half year(R/2), rate per quarter(R/4), rate per month(R/12) if the interest is calculated half yearly(2 times), quarterly(4 times) or monthly(12 times) respectively. Also, note that in such cases N changes to 2N, 4N and 12N respectively. 4.7 Problem 8: What is the maturity amount on Rs 50,000 placed with the bank if it pays 6% compounded interest for the first three years and 7% for the next two years with interest compounded every quarter. Hint: As in 4.7 Problem 6, solve the problem in two steps as shown below by using the formula A = P*(1+(R/t*100)) N*t.
2. With the maturity amount as obtained in step 1 as principal, calculate the maturity amount for next two years (8 quarters) @7% (N=2, t=4, R=7).